I first got into wax melts early this year. I pretty much swore off candles then with the exception of fall/holiday candles. Candles do take up a lot of space when you have small living quarters and they can get expensive. I failed my candle swear off this week, and bought my first few candles probably since last January. I guess I didn't entirely fail as I did make an exception for fall and holiday candles, but still. I'm not going to be big into candles at all like I used to, but I did clean out some stuff, and made an area to store all my wax melts and candles. Also, Bath & Body Works coupons and their candle sales were burning a hole in my pocket. I'm still all about wax melts, but I don't think I can ditch candles completely especially during fall and winter. This week I burned some candles and melted some wax! My Thoughts: I'm not a big fan of bakery scents, and almost all pumpkin scents as of late go that route. Sweet Cinnamon Pumpkin while it does have that vanilla note to it, doesn't smell very bakery to me at all. It's not sugary sweet, but to my nose a simple blend of pumpkin and cinnamon. It smells like Thanksgiving Day when you wake up early to watch the Macy's Thanksgiving Day parade. I know that's not really helpful of a description, but it is that comforting familiar scent of Thanksgiving. It's warm, inviting, and cozy. It's a nostalgic scent to me, that I absolutely love. My Thoughts: This has been one of my staple winter scents since it was released a few years ago. The best way I can describe it as if you went outside on a snowy day and could smell peopoles fireplaces burning outside in the distance. It's crisp, refreshing, and has a natural campfire/smoky smell to that balances it out. The smokiness is not in the slightest bit overpowering or unpleasant, it blends in so naturally with the other scent notes. My Thoughts: This is exactly who it's described. I love aromatherapy and lemongrass and lavender are very common oils/scents used in that. This has that soothing blend of the lavender with the sharpness of the lemongrass. It's an herbal scent rather than a sweet lavender or lemongrass. I really like it. I melted this in my bedroom and found it perfect scent for settling down at bedtime. My Thoughts: I mentioned last week that Bath & Body Works Merry Mistletoe candle is my favorite scent in the entire universe. It's always a toss up on if B&BW will bring it back each year, and I really wanted needed it in a wax melt. I did some searching, and found a vendor who makes it. This is a spot on dupe. Merry Mistletoe to me smells like orange juice, cranberry juice, champagne, and spruce all mixed together. It is a juicy, effervescent, and festive scent. It is absolutely delightful and this is my signature holiday scent. I burn/melt this so much I become noseblind to it. I love it so much I have to take breaks from it so I can smell it again! My Thoughts: This is in the same vein as Lavender Lemongrass, it's just mint not lemongrass. It's a very herbal and aromatherapy-like scent. It's soothing and calming. It's not as intense as lemongrass as lemongrass as very pungent, but it's still a strong scent. I like this one, another favorite bedtime scent. Scent Description: A bright pairing of crisp Riesling grape & juicy California pears. My Thoughts: A common theme in scents I like (as you see with Merry Mistletoe) are juicy, bubbly, and fruity scents. Sparkling Pear Riesling is exactly that. You get strong notes of the pear and that sparkling wine scent along with it. Lovely scent, not up there with Merry Mistletoe, but I love it too. 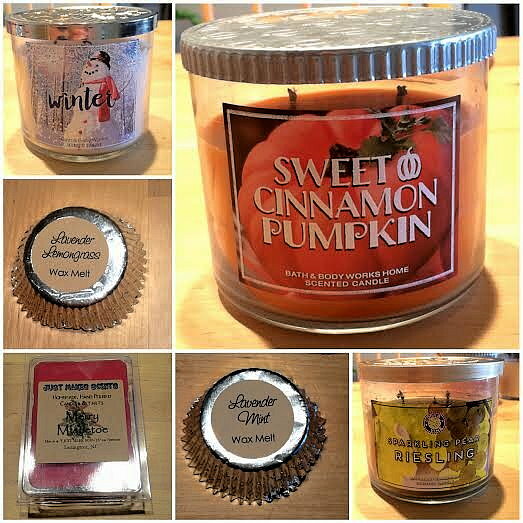 Bath & Body Works candles can be purchased in store or online. I highly recommend only buying their candles when they're 2 for $24. They have candle sales frequently. Also, sign up for their emails, so you can get coupons! I purchased Just Makes Scents through etsy and Ten Digit Creations can be found here.